If you read my previous article then you know that we are all expecting Sony to announce the Xperia Z1′s small sibling, the Xperia Z1s. While the world awaits (the device is already on sale in Japan as the Xperia Z1f), there’s a curious listing on one of the leading consumer-to-consumer e-commerce sites in Kenya, OLX. In that listing, the Xperia Z1s is being sold for a whopping Ksh 126,000 (an equivalent of US $1,386 as per today’s exchange rates). That’s ridiculous. Maybe whoever posted the listing meant to put his Xperia Z1 for sale and the extra S is merely a typo. Then again, from the username of whoever listed it, he’s a Kenyan in Nairobi thus knows that the market price of the Xperia Z1 is less than half of the marked price of that Z1s of his. On the other hand, this could be the Japanese variant (Xperia Z1f ) on sale in Kenya. This is highly unlikely since the image used does not represent that device as we know it. Secondly, the Japanese variant is carrier-specific. While carrier-specific models actually do find themselves overseas, it is highly unlikely that this is the case here. 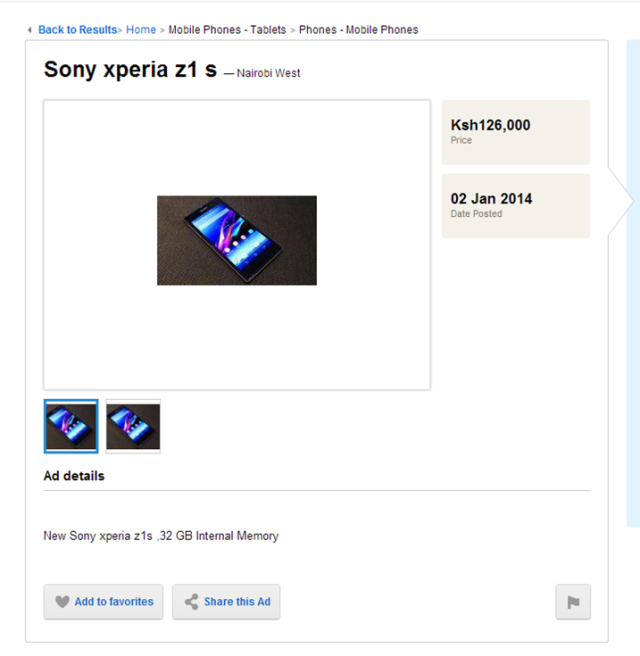 Whatever the case, there’s a purported Xperia Z1s on OLX Kenya.